Oh the benefits of diminished expectations! Superman (Henry Cavill) is being called to account for his actions especially after the events in Metropolis from the first film. Someone who agrees he should be viewed as more of a threat than a hero is Bruce Wayne (Ben Affleck), who dons the cowl to fight the ‘Man of Steel’ physically and ideologically. 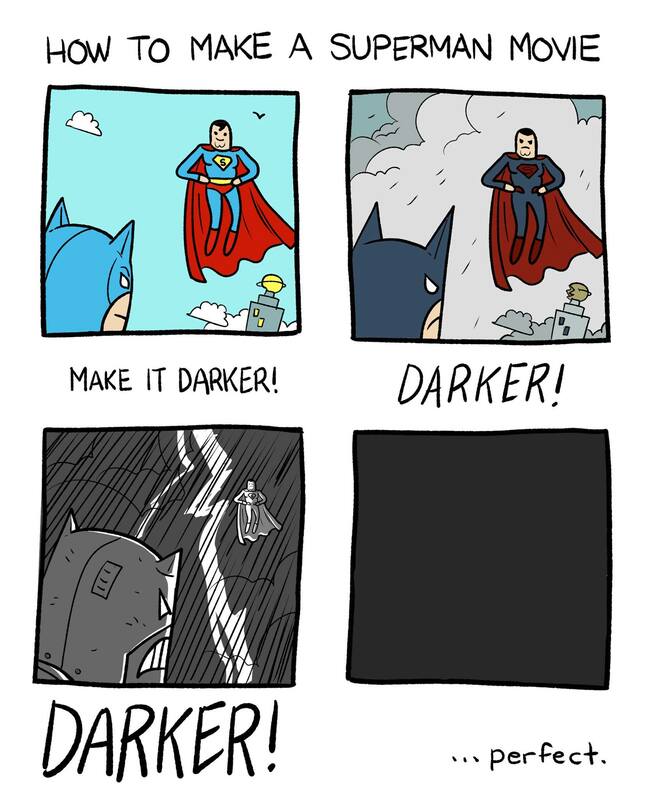 ‘Man of Steel’ really annoyed me. There was huge potential with Henry Cavill who looks the part and Snyder’s direction which often gets good action and stunning visuals. However, so much else let it down, it left me sorely disappointed. So then, going to see this at the first midnight screenings, I wasn’t expecting much. That helped, a lot. It’s more accurate than you might think. The reality is that most of the film is somewhere between pictures two and three in that cartoon, meaning that there’s a real absence of colour as everything is so dark, and I saw it in 2D so I dread to think what it’s like in 3D with the additional brightness loss that’s associated with stereoscopy. When there are explosions or flashes of lightning we get momentary glimpses of the red and blue suit, Batman’s shades of grey and other small touches of colour that come as welcome relief, yet in the most part the film might as well have been shot in monochrome. There are some really great aspects to this movie, not least the much-publicised inclusion of Wonder Woman played by Gal Gadot. I was initially sceptical about her casting as she looks more supermodel than warrior, however the way in which her character is introduced and featured works very well for her. Sadly, this too gets ruined by her character having the most ‘sore thumb’ moment of the film. There are a few story development issues with the movie, none more infuriating than a scene with Diana Prince opening her emails at the point in the film in which the whole promise of the title is about to be capitalised upon. She not only reads an email but takes the time to open not one, not two, but four attachments pertaining to future members of the Justice League! At this point Zack Snyder forgets what comes before the colon and steers too strongly and prematurely into what comes after, foreshadowing in the most clunky and badly timed way. 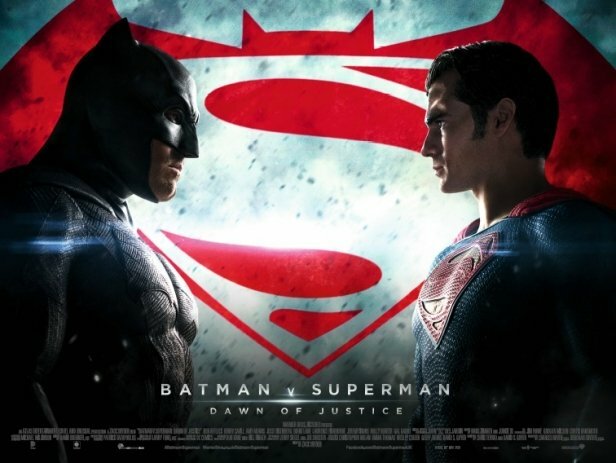 I wanted this to be ‘Batman v Superman’, fully enjoying both the ideological differences and physical clashes that bringing these two heroes together would create. While the film does have that, it doesn’t ever take it to completion, falling short every time we think it’ll delve deeper into the brilliant potential. Sadly, part of the reason for that is also a big part of what made the film enjoyable, the inclusion of Wonder Woman, Lex Luthor (a whole article alone is needed on his part) and Lois Lane. They are all very good in their own ways, especially for me Lois as I thought there wasn’t enough development with her character in the first film to justify their instant relationship. Yet, I can’t help thinking this film would actually have been even better without them, moving a lot of their threads and other parts into the next film, setting a brilliant start to ‘Justice League’ while an unnecessary clutter for ‘Batman v Superman’. The last act especially feels like it should have been saved for the first part of ‘Justice League’ next year and not crammed into this, plus it would’ve made this film a good 30mins shorter which wouldn’t hurt. Already there have been online petitions calling for Snyder to be removed as the director on ‘Justice League’ and the rapidly dissipating excitement has shown in the steep box office drops. However, the film is just too big to completely fail. A decently made Superman film will always do well, e.g. ‘Superman Returns’ (which I have a certain fondness for) was said to be a disappointment, yet it took over $390m at the box office before even considering the number of DVD and Blu-Ray sets that this new addition to the franchise helped sell. The same would be true of a Batman movie, especially after the huge success of Christopher Nolan’s trilogy. Even ‘Batman & Robin’ took nearly $240m, again before factoring in the home media sales (I myself have the 4 movie set). So then, a Superman AND Batman movie couldn’t possibly fail to recoup even a large budget, just on the strength of opening day screenings alone and the first viewings of fans who want to at least see what it’s like. The cinema I went to at midnight had 3 screens showing simultaneously, while not all filled to capacity they were full enough to make it worthwhile. It’s no failure by any stretch but to have a sharp 58% drop in the first weekend is incredibly bad. In contrast, look at how ‘Ant-Man‘, a film widely expected to flop, didn’t open particularly big and strong yet somehow kept steady box office returns for a really long time and managed to finish its theatrical run with a really great haul as well as overwhelmingly positive vibes from fans and critics alike, causing the announcement of the sequel to be met with great enthusiasm. Sadly ‘BvS:DoJ’ has gone more in the way of ‘Fant4stic‘ which opened strongly enough to people who went (as I did) hoping the best, but then saw none of them return, nor their friends who were told immediately and with no uncertainty not to bother. It’s a film that with so many flaws as well as touches of real brilliance and even more of unrealised potential, is always going to divide audiences. If you liked ‘Man of Steel’ you will probably like this, if you didn’t, you probably won’t but you also can’t rightly claim to be be disappointed by it, sadly with Warner’s handling of their DC properties in film this is what we’re coming to expect. Their TV output is so much better at embracing the colour and humour that always made the source comics so popular, yet these new films are actively distancing themselves from that and they should be ready to pay the price. The petitions are right, giving control to Zack Snyder is just not working, the upcoming films helmed by others will likely only highlight that fact all the more. Warner Bros. need to put someone else behind the camera for ‘Justice League’ or they may find themselves dealing with a film that will more than just ‘underperform’. This entry was posted in featured, Film, Super Saturday and tagged 2016, comics, DC, drama, featured, film, movie, movies, review, sci-fi, science fiction, superhero. Bookmark the permalink. Scandal: Too scared to forge its own path?